Skype today announced the release of version 5.6 of its iPhone app, bringing with it a user interface that is scaled for the iPhone 6 and 6 Plus. This is the second significant Skype update in less than a month and follows an iOS 8-optimized version that debuted at the end of September. 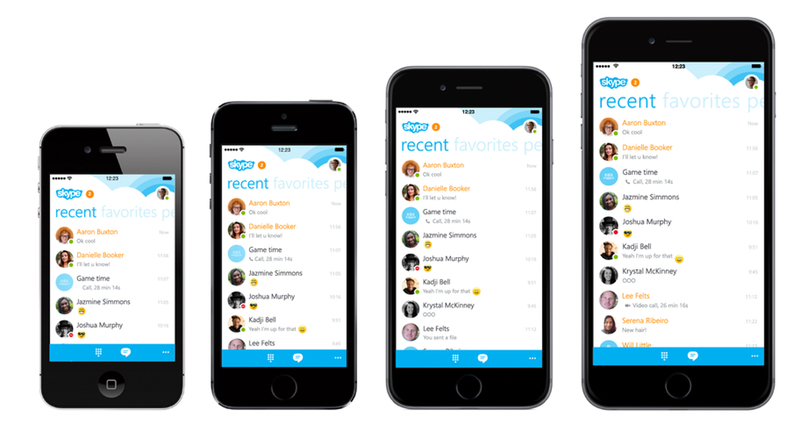 The latest version of Skype for iPhone now supports all device screen sizes from the 3.5-inches of the iPhone 4 up to the 5.5-inches of the new 6 Plus. The biggest difference will be seen by iPhone 6 Plus owners, who now will be able to view additional messages and chat logs on the larger screen. The full change log for the 5.6 release includes changes to the contact profiles and general improvements to the app. Skype for iPhone [Direct Link] is available for free from the iOS App Store. Still waiting for many of my daily apps to be optimized. Pixel-wise, maybe. But they didn't really take advantage of the extra space. Nothing on that operating system does, sadly. I don't need Skype optimized. I need it fixed. I think he probably meant that the UI doesn't take advantage of the bigger screen size. It doesn't do anything with the extra space, other than filling it out. I doubt that we'll see many apps that try something different for the bigger screen. It will probably be limited to the 6 Plus landscape mode. I had to forward emails from an Outlook account and I could not believe how severely disorganized the webpages were - seriously could not believe it, all hate aside. I'm wondering if Microsoft has moved to India? That's weird - I usually keep Skype off so hadn't noticed. Thanks for the heads up! PS Who the heck is designing this software anyways?